I’ve been participating in a “decade of the month” club type thing where you watch as many films from a particular decade as you can in a month. Seems a folly, but I like order in my viewings. Anyway, I’ll post a few ‘reviews’ (though they’re just thoughts in long-form as I’ve not written a true review in ages) and I’ll try to post something everyday to get back on track with this blog. Maybe another ‘rare script’ will fall into my lap and I can regain all my lost readers, haha. At TIFF last year, two people told me I had missed a film that I would’ve loved greatly – one hated it and one liked it a fair bit. It was Hadewijch – a film I skipped because I wasn’t sure of Dumont as I’d not seen a film by him and he was very polarizing with his audiences. I can say that, now, my skipping Hadewijch is the most regrettable thing I did at TIFF because I believe Dumont, based on this singular film, is one of the most pedantic professors in the pathos of people. Sitting at 140 minutes, this thematically diminutive tale takes on grandiose measures to get across what would normally be advocated as a standard theme: that humanity mostly resides in the innocent. The protagonist is named Pharaon (French for Pharaoh) and aptly so as he tackles the martyrdom that is leadership in a corrupt world. So much so that I’d go as far as to say he’s an emblem for Jesus Christ as Pharaohs were often considered appointed by God as Jesus, well, obviously was. It’s sparse with dialogue, so it relies entirely on the visual element which Dumont has proven himself a craftsman with. From the close-ups on the eyes of the emotionally daunted to the more distances shots that allow you to define each character through their body language to the more superficial but all important landscape shots to transcribe the poetry of the world and how humans have so contradicted it all – it’s all poignantly manifested and hardly anything seems out of place. Before I move onto what is wrong with the film, I’d like to say that the shot that delicately suggests levitation from Pharaon is one of the most exhilarating photographic choices in cinematic history and really messed with my mind. Very simple, yet entirely effective – sums up the movie pretty well. There is only one element of the film that isn’t great or better – it’s the dialogue. Now that’s hardly the centerpiece of L’humanite, but it does reveal important information very bluntly which opposes the regulated speed with which other revelations are dealt through aforementioned techniques. Dialogue such as “He’s suffered – his wife and child died two years ago” impede the methodical design of the otherwise perfect film. Especially when lines like those feel hamfisted into the story and are hardly said in passing. Schotte and Caneele won Best Actor and Actress at Cannes in 1999 – the film took home the Grand Prize of the Jury. The first win I’m extremely fond of – at first I was hesitant to agree with Schotte’s win, but after pondering his extremely honest work I am in love with this win. Caneele’s not so much – it’s more bold and furious than aptly portrayed, but it’s a fine performance nonetheless. Won purely on the grounds that it takes a dedicated performer to be so revealing – both emotionally and physically – in their first performance. The film is very Bresson-esque, if not for the histrionics sometimes used to get an emotional message across. From the exhausting trekking from one place to another with a cumbersome burden to the nonchalance that is Pharaon and his informing others of tragedy to the ambiguous scene near the end where the protagonist makes out with the guilty party, L’humanite is an invigorating and enticing allegorical accounting of Jesus Christ. It even has the occasional graphic scene that’s harder to stomach than anything Gibson’s ‘Passion’ churned out. Amazing and it’ll only get better with each additional reflection. A year prior to Takeshi Kitano’s name spread across the cinematic world like wildfire with the release and subsequent acclimation for Hana-bi (Fireworks), he made a touching coming of age tale about two lost teens who exhausted their disconcerting mindset through aggression – often bullying others and partaking in lunch room shake downs. The film is Kids Return and despite the condemnable attitudes of one of the film’s most prominent characters, the story is surprisingly saccharine as a love letter to youthfulness. At the beginning of the film we see our protagonists meeting up after a long delay in their friendship. In cinema, I find beginnings such as these frustrating because often filmmakers do it to add an air of suspense. “Why were they on differing terms earlier in their lives?” – and so the film tells that story. The thing is, more often than not these openings ruin what could be an exhilarating narrative by giving away the ending at the beginning. That applies here as the story is about two desolate friends – Masaru, the definition of a bully and someone who only exists to torment others and live hedonistically off the money he’s stolen and Shinju, destitute youth who follows Masaru and his toxicity because it gives his life some meaning and some semblance of family. I say this because their family lives are never touched upon – their ‘homes’ never seen; these characters are true street urchins and can be sympathized with if you believe that Masaru is merely a person who has succumb to petty crime and terrible deeds only because that’s how he has been raised during his life on the street. I won’t go as far as to indemnify the character for treating a myriad of fellow students as peons, but Kitano’s laconic approach to his protagonists’ psyches does make that ideology an easier pill to swallow. 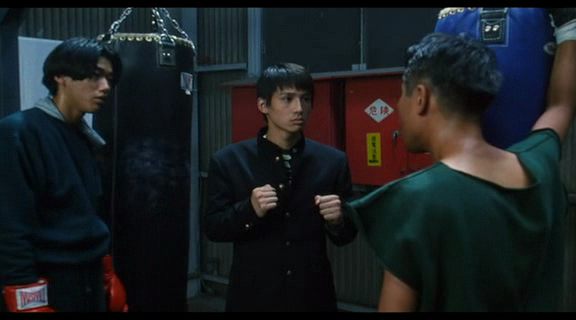 Eventually, Masaru’s misdeeds catch up to him and he’s pummeled by the boxer brother of a kid he robbed. Embarrassed, he falls into seclusion, only to pop up a few days later; greeting a worried Shinju with his new-found aspirations of becoming a boxer and forcing him to become a boxer like him. A subplot dictates the melancholy of youth if trekked on alone by subtly (but not really because the story feels shoved in to add a more relatable character for non-bully sympathizers) introducing a character that Masaru tormented. The character’s name is Hiroshi and he’s a somber kid. He devotes all his free time to a cafe where he quietly eyes the woman of his dreams, a waitress named Sachiko. It’s rather touching, but seems completely out of place in the film. It’s one of those stories that you appreciate for being earnest, but clashes with the mentality of everything else that the film perpetuates. Needless to say, his story ends tragically which drives home both a “we all need somebody to care for us” mentality, while blatantly taking a shot at corporate Japan in the process. That last part… bombastically crammed into the film. Terrible decision. What I appreciated most about this feature is that it doesn’t attempt to clear the conscience of malignant Masaru, but attempts to give you insight into a day in the life of someone like him. There’s no sympathy to be doled out for him; all Kitano asks of you is to watch as he progresses in life and make up your mind about his character. You might hate him by the end of the film, but that’s fine because, as well all know, no wrongs can be remedied and to project that amicably in cinema is patronizing at best. Shinju, on the other hand, is a different story altogether because he’s the character we’re most meant to identify with, which we do because he’s constantly being pushed around by other people and it’s manipulatively tragic. So you take the good with the bad in Kids Return. It’s affable enough to be continually entertaining while dark enough in the second half to ignite legitimate conversation about what the film preaches. And while the ending leaves a lot to be desired, it’s ambiguous in the best of ways – simultaneously hopeful and despairing. One of the more disappointing films I came across during my 90s scavenge was the Jean-Pierre Jeunet/Marc Caro collaboration Delicatessen, a film that only finds any sort of consistency in its visual design and that’s ostentatious at best. The “story” if there is one, is about an out of work clown named Louison (Dominique Pinon) looking for work in the sordid Dystopian world that he now permeates. Unfortunately for him, the place he’s arrived at his notorious for cannibalism, but Louison being an out of towner, he has no idea what he’s in store for. Neither did I. Fortunately for him, things work out affably – unfortunately for me, my viewing of the film didn’t. 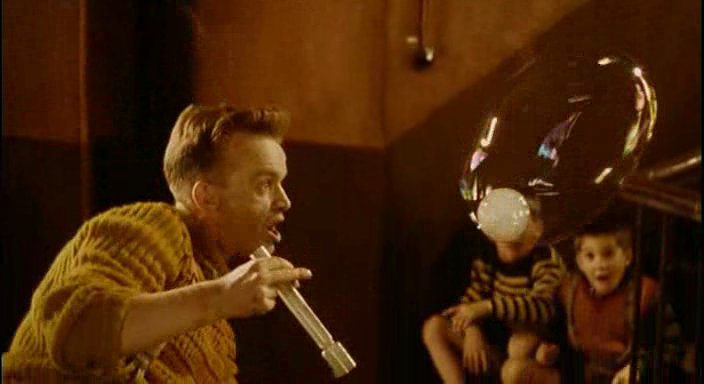 Jeunet and Caro attempt a very specific form of wry, sardonic humor – done almost in the vain of the Marx brothers. The problem with this idea is that the Marx brothers relied on innocence and expanding on simple ideas where as Jeunet/Caro aspire to exploit a dark scenario with the levity of slapstick. In this regard, the contrast has resonated with some, but for me it’s more erratic “look at me” type pageantry than something of artistic merit. Like your typical Miss America Pageant contestant, it’s all style no skill; many people accept it on those grounds alone. While not judging it on its barren story, the feature is hit or miss with its gags and visual intrigue. Kind as I often am, I chose to head this review with one of its more genuinely whimsical moments in the bubble sequence. It’s imaginative, carefully cut and sets up the later, sparsely delved into romance between Louison and Julie (a beautiful portrayal by Marie-Laure Dougnac). Despite all their eccentricities, Jean-Pierre Jeunet and Marc Caro are boring filmmakers. I’m beginning to see a trend in Jeunet’s work – he’s good for a short period of time, but once you’ve gotten that initial shot of adrenaline the ensuing six others are ineffective and only annoy. A typical debut – a film that lacks restraint. The last film I’ll discuss in this redemptive post is a film that, not unlike Kids Return, discusses the perils and petty crime of youth. Though the title is translated into Rebels of the Neon God for English speaking countries, it (apparently) literally means Teenage Nezha which will give you more of an idea for what the film wishes to accomplish with its allegorical narrative. For much of the duration of his film, Ming-liang Tsai slowly pieces together a palpable plot. Near the beginning, three rowdy youths drive by tenuous Hsiao-kang (Chao-jung Chen) and his father in their cab. After Hsiao-kang’s father gives the hooligans his two cents, they smash his sideview mirror and peel away from the scene of the crime. Later this comes back to haunt them as Hsiao-kang spots the trio at a food court and begins to stalk them. The trio of ‘friends’ – Ah Tze (Kang-sheng Lee), Ah Bing (Chang-bin Jen) and the girl they both want to bang Ah Kuei (Yu-Wen Wang) – occupy their time with arcades, jokes and the occasional evening crime (crimes that Ah Kuei is unaware of). They’re slackers of the most loathsome variety who steal joy (the motherboards of the arcade games) but only fall deeper and deeper into despair. On the other side of the story, we have Hsiao-kang. While in the bathroom, he overhears his mother speak to his father about the possible past life that he had… as a God. A social reject and intellectual maladroit, Hsiao-kang responds to this news by dancing like an idiot and causing his father to hold more disdain for him than ever before. Sure, it’s an abstract scene, but it gets the point across that Hsiao-kang is an alien among the rest of society, not knowing how to relate and not ‘really’ having anyone. So when he spots the vandals at a food court and begins to stalk them, you really have no idea what you’re in for. Well, neither does Ksiao-kang. This is one of those films that will either resonate completely with you or you’ll be bored out of your skull. Tsai’s approach to cinema seems to be “the more tacit the better” which I agree with completely. But if you’re a person who gravitates more toward the three-act structure of cinema as opposed to ‘a day in the life’ type features that don’t resolve each storyline, then you might have to avoid this. However, if you spent plenty of your youth basking in the glow of arcade game screens and enjoy the idea of long scenes of quiet tension developed through the wonderful world of stalking, then this just might be for you. I’ll be following 70s cinema closely this month and I’ll do my best to post something every few days.